Savvy Crowdfunding or Annoying Spammer? There's been a bit of a backlash recently against Kickstarter, and indeed, against crowdfunding as a whole. That's because there are an increasing number of hapless crowdfunders who aren't clear on the difference between enthusiastically promoting their work and spamming the internets with their demands for money. 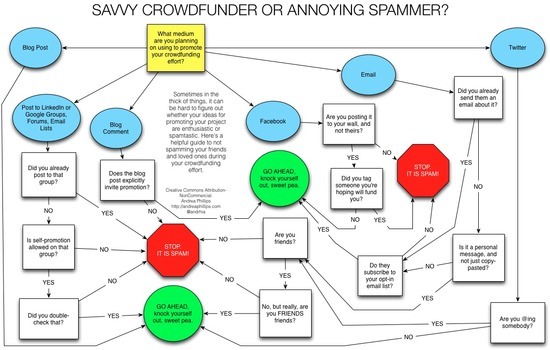 In the interests of preserving the reputation of crowdfunding as a whole, I've developed a helpful flowchart to use when trying to decide whether you're breaking the social contract in your efforts to promote your crowdfunded project. Click to expand. Enjoy!